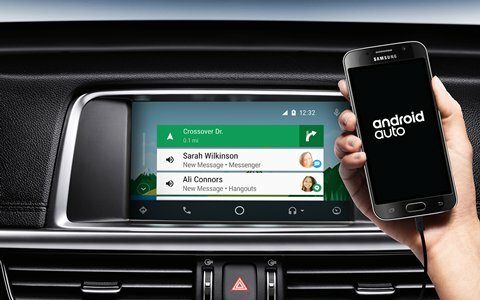 Android auto is an app designed to take a further step in to the technology to bridge the gap for android users, in addition it also developed to prevent the drivers to avoid distraction using phone while driving, android experts taken all measures before making this app according to android. What requirement android auto need to use that? To use that app, you need to require four major items (USB, Phone, compatible stereo and the App), App can be downloaded easily from play store a direct link is available for you to download it. Go to mobile android auto app. Once you opened from mobile a app displays on your car screen- hit the app button to run it on your car screen. Make sure to enable location and Bluetooth for full connection, apart from these you don’t have to do anything except these steps as stated before. How and which apps can I use on android auto? You can use your google maps, google assistant, music, calling and messaging directly from your car screen. Android auto allow to use other apps available in there play store. Next: Select App to download. All these apps are compatible for android auto. Once the app connected with car screen display, a separate app in to your android auto pop up, clink it and you will get the mobile phone interface at your car screen. As you can see a few tabs available at the end of a screen, to get in to google maps you just have to touch the arrow button placed at below left corner, you can use google maps via google assistant or from screen keypad. You can listen radio and other music directly from apps, you have many options in the android auto market to download for either radio or music. (Google play music, Pandora is one of a few music apps that can allow you to play music whatever you want to play). You can call or text message from your screen, a separate tab on Android Auto main home screen is available for calling and text, you can use google assistant (voice) as well for calling and text after say ok to google. You can play media files on your car screen via Android Auto, however I wouldn’t recommend media files to use it on a car screen, it could lead to a fatal car accident. Uninstall current version of android auto and reinstall 2.9 version of android auto app from playstore. Next: Turn off auto updates of google play store (Press on a pop up shows do not update auto apps) via go to google play store settings. Next: once reinstall new version of android auto- clink android auto main menu placed at the left corner side then go to: About android auto. Next: Tap few times on About android auto to enable developer settings- then clink at the top right corner side to be able to go developer settings. Next: Enable 720, 1080 video output, and unknown sources. Next: Install web browser car stream, once you installed, it will automatically opened up to Plex, you can literally stream movies, video songs, season whatever you want to see on your vehicle. Next; For those who don’t have Plex use terrarium tv: go to movies-select the movie-hit the play button, instead of playing it will find sources where you can download it. Next: After hitting the download button, let go back to car stream and go to bookmarks where you can see internal storage- downloads- hit download and you can see the movie you downloaded. Next: Connect your device with your vehicle open android auto-click the screen last tab button at right below- press car stream. Next: Car stream boot in to YouTube- open YouTube bookmark-hit internal storage- hit downloads- hit the movie you downloaded and then it will play on your car screen. Is google assistant is available in all countries? Google assistant only available in USA market with English language version, soon it will be available to other few countries as well. No, android auto app is available on limited countries to the numbers of approximately 31. Argentina, Australia, Austria, Bolivia, Brazil, Canada, Chile, Colombia, Costa Rica, Dominican Republic, Ecuador, France, Germany, Guatemala, India, Ireland, Italy, Japan, Mexico, New Zealand, Panama, Paraguay, Peru, Puerto Rico, Russia, Spain, Switzerland, United Kingdom, United States, Uruguay, Venezuela. Android app compatibility start from Lollipop 5.0 android software phones, however the marshmallow 6.0 is better than lollipop for the app to work optimally. A complete list of all compatible cars available on a separate article, find your car by clicking this link. All these information are taken from android.com. i209, i902D, iLX-207, iLX-702D, INE-W710D, INE-W977A, INE-W977HD, X208AU, X208U, X209D, X802D-U, X902D. KW-M730BT, KW-M745DBT, KW-V830BT, KW-V930BW, KW-V930BWM. AVH-2300NEX, AVH-2330NEX, AVH-2400NEX, AVH-2440NEX, AVH-3300NEX, AVH-3400NEX, AVH-4100NEX, AVH-4200NEX, AVH-4201NEX, AVH-W4400NEX, AVH-X8700BT, AVH-X8750BT, AVH-X8790BT, AVH-X8800BT, AVH-X8850BT, AVH-X8890BT, AVH-Z5000BT, AVH-Z5000DAB, AVH-Z5050BT, AVH-Z5050TV, AVH-Z5080TV, AVH-Z5090BT, AVH-Z5100BT, AVH-Z5100DAB, AVH-Z5150BT, AVH-Z5150TV, AVH-Z5180TV, AVH-Z5190BT, AVH-Z7000DAB, AVH-Z7050BT, AVH-Z7050TV, AVH-Z7080TV, AVH-Z7100DAB, AVH-Z7150BT, AVH-Z7150TV, AVH-Z7180TV, AVH-Z9100BT, AVH-Z9100DAB, AVH-Z9150BT, AVH-Z9190BT, AVH-ZL5150BT, AVIC-7100NEX, AVIC-7200NEX, AVIC-7201NEX, AVIC-8100NEX, AVIC-8200NEX, AVIC-8201NEX, AVIC-F70BT, AVIC-F70DAB, AVIC-F70TV, AVIC-F77DAB, AVIC-F80BT, AVIC-F80DAB, AVIC-F80TV, AVIC-F88DAB, AVIC-W6400NEX, AVIC-W8400NEX, AVIC-Z810DAB, AVIC-Z910DAB, FH-9300DVS, MVH-2300NEX, MVH-2400NEX, MVH-Z5050BT, SPH-DA230DAB. DDX6704S, DDX6705S, DDX6904S, DDX6905S, DDX8905S, DDX9016DABS, DDX9016S, DDX9016SM, DDX9017DABS, DDX9017S, DDX9017SM, DDX9018BTS, DDX9018DABS, DDX9018S, DDX9018SM, DDX916WS, DDX916WSL, DDX916WSM, DDX917WS, DDX917WSM, DDX918WS, DDX918WSM, DDX9703S, DDX9704S, DDX9705S, DDX9716BTS, DDX9716BTSR, DDX9717BTS, DDX9903S, DDX9904S, DDX9905S, DMX7017BTS, DMX7017DABS, DMX7018BTS, DMX7018DABS, DMX7704S, DMX7705S, DMX8018S, DMX905S, DNX516DABS, DNX5180BTS, DNX5180DABS, DNX5180S, DNX5180SM, DNX518VDABS, DNX574S, DNX575S, DNX694S, DNX695S, DNX7160BTS, DNX716WDABS, DNX7170DABS, DNX773S, DNX775RVS, DNX8160DABS, DNX8160S, DNX8160SM, DNX8170DABS, DNX8180DABS, DNX874S, DNX875S, DNX893S, DNX9170DABS, DNX9170S, DNX9170SM, DNX9180DABS, DNX9180DABS, DNX9180S, DNX9180SM, DNX994S, DNX995S, DPV-7000, KW-M730BT, KW-M740BT, KW-M740BTM, KW-M741BT, KW-M745DBT, KW-M845BW, KW-V830BT, KW-V840BT, KW-V930BW, KW-V930BWM, KW-V940BTM, KW-V940BW, MDV-Z904, MDV-Z904W, MDV-Z905, MDV-Z905W. Maximum understanding of How to Use Android Auto – Complete Tutorial Series.